What does every kid love? A swing! But would you let your children play on a swing that might be unsafe? I definitely wouldn’t. Anyway, why not just buy the best for them? That’s why we researched all kinds of outdoor baby swings and created this TOP list to help you. 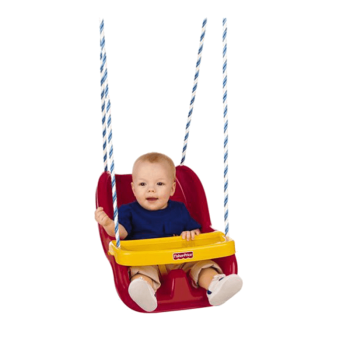 One of the best selling swings for infants and toddlers. What can go wrong when buying a swing? All the swings are the same – not true. While most swings today have high safety standards, the quality of the material and manufacturing is crucial. 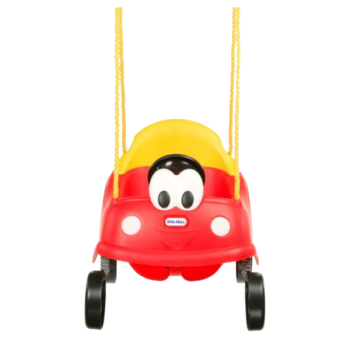 Little Tikes 2-in-1 is both safe and quality made. Manipulation is extremely easy and swing is very safe because of the simple T-bar and stay-put shoulder straps system. One of the great and practical features is a capability to store T-bar and straps conveniently out of the way – at the bottom of the swing. This is especially useful when your children grow older and no longer needs this securing mechanism. Great choice for those who want to have a cheap but reliable and safe outside baby swing. One of the most popular children swings on Amazon. It also has a tray for snacks or toys which can be easily lifted (Not by children itself, that would be dangerous). This swing is rated for 6 to 36 months old children. It has a dual restraint system with three-point harness to secure the child. Maximum supported weight is 45 pounds. 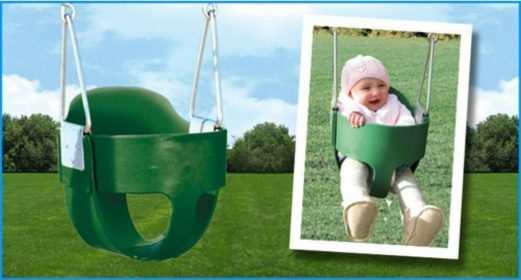 Another great choice when it comes to outdoor baby swings. This swing is made to survive any weather conditions. The high-quality plastic is UV resistant to withstand hot summer sun, and yet durable enough to survive the winter. The swing can, of course, be used inside. It might not be the best idea to swing outside during the winter. With a weight limit of 50 pounds, it’s suited for both infants and toddlers. 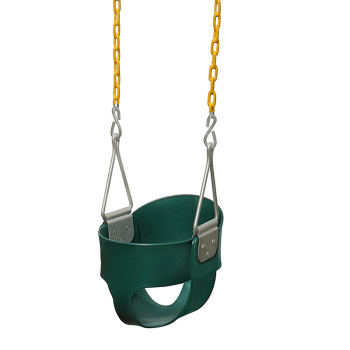 This is a really heavy duty swing with weight limit more than 200 pounds and steel chains. The steel chains are coated in plastisol for comfortable grip and safety. These coated chains are not that cold to the feel as non-coated steel, making it much more pleasant to hold the chain. The chain length is adjustable to fit most of the swim beams. Being full bucket type with a higher back, it’s extremely safe to use from infants to toddlers. Very affordable infant outdoor swing. Higher-than-usual back is great not just for children’s comfort, but mostly for safety. For even more safety, there is a seatbelt included to secure your child in the swing! To make entering and exiting the swing as easy as possible, the leg openings are extra wide. Everybody knows how a shoe can get stuck into the swing while lowering his child into the seat. The whole swing, both the seat and the ropes are weather resistant. The manufacturer recommended age is from 9 months up to 3 years. Some people also let their 7 months old children in. Some as soon as they can hold their head on their own, but you have to be really gentle with the swing. There is no hardware included other than the swing and ropes, so if you plan to attach it to a wooden pole, you might need to buy some more stuff. Now, this is a really sweet swing design. The swing looks like a smiling car with eyes (check photos!). But not just that, it also has a steering wheel with horn for added fun! Max supported weight is 50 lbs. Recommended children age ranges from 9 months to 3 years. The back is higher, to support back of your kid. Another safety feature is the seat-belt. If you want an awesome swing for your children or grandchildren, they will surely love this one. Children have a great imagination, and what is more awesome than driving a flying car? Heavy duty outdoor baby swing with a weight limit of 200 lbs. That means a huge safety margin as far as strength goes. But not just that, it also means the swing is ready to withstand all weather conditions without any problem. The seat is made of 80% EVA and 20% polyethylene – very sturdy material. The chain is coated with yellow plastic. That makes it much more pleasant to touch, it feels much warmer than metal. And what is most important, it also makes the chain pinch resistant. Jungle gym kingdom is super safe for children with it’s higher back support. The swing seat is attached to the chain using triangular hardware, coated with DACROMET (I’ts not galvanized). Dacromet is just as good in preventing rusting as galvanizing. 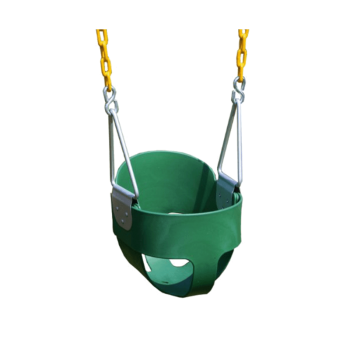 Another heavy duty bucket swing made of a commercial grade plastic. It comes with a chain for easy installation. While manufacturer suggests it’s for children up to 10 years old. We would like to advise you that your child would have to be really slim to fit it that old. No worries, the length of the rope is also easily adjustable. Not just that, the manufacturer also included additional straps and snap hooks you can use on a tree branch or similar. The plastic on this swing seems a bit weaker and more prone to breaking. Parents would probably agree that baby swings are miracle workers when it comes to making their babies eat or sleep. 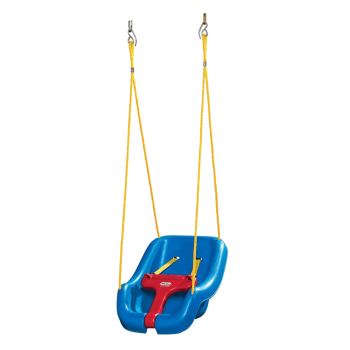 There are baby swings that can be used up to 18 months while there are toddler swings that can be used for over two years. For parents to properly choose the baby swing that will fit their baby’s needs, it is better to look at the different types of swings available in the market. This is the most comfortable type of baby swing because of the different features that it offers. 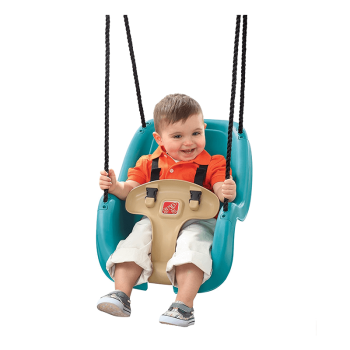 Full-size baby swings are ideal for bigger rooms because of its size. 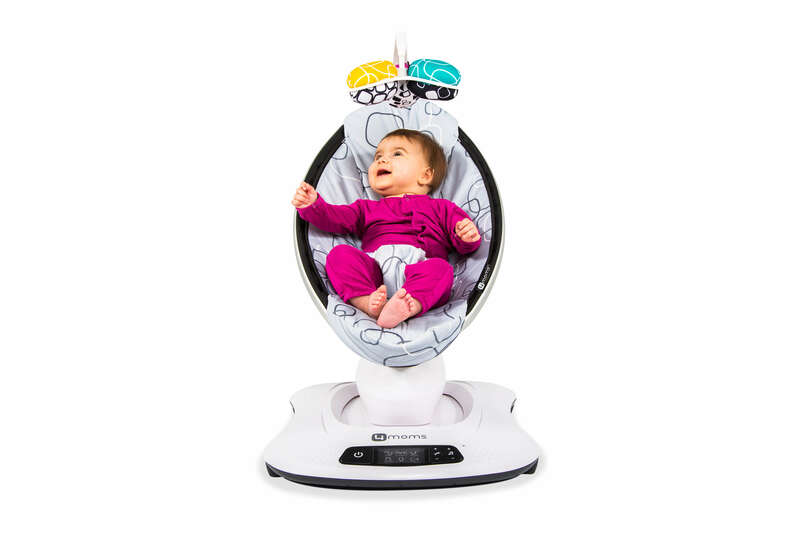 The parents can choose the speed of the swinging motion to make their baby comfortable. It is also durable and can last for a longer time compared to the other types. As its name implies, this type of swing can be brought anywhere. This is ideal when the parents want to take their baby when they go out for a small picnic or a trip to the local mall. 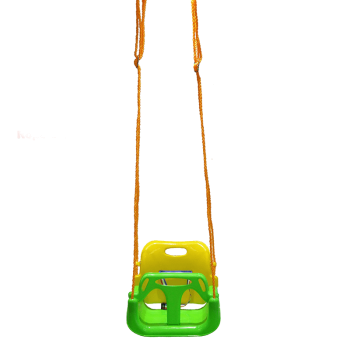 Since this is designed to be carried anywhere, the portable baby swing does not have the various features like that of the full-size baby swing. It is designed to be light and simple. Babies aging one month to a year old can use this type. This can carry babies weighing 2.5 kg to 12 kg. Check out our review of this portable baby swing with AC adapter. Combination Baby Swing is an all in one type that can be used as a bouncer, rocker, glider, or cradle. It does not take up a lot of space, unlike the full-size baby swing. This type is also known for its convenience. Parents can leave their babies in the swing to do other things without worrying. Most of the models available are battery-operated so the noise produced by the swing is minimized. This leads to lesser disturbance when the baby is sleeping. This is ideal for babies aging up to one month to a year old. This type is mostly used to make the baby sleep in a more comfortable way because of its gentle motions. Glider swings can be easily moved from one place to another so parents can keep an eye on their child wherever they are inside the house. This type is used when the baby is wide awake and it’s already bedtime. 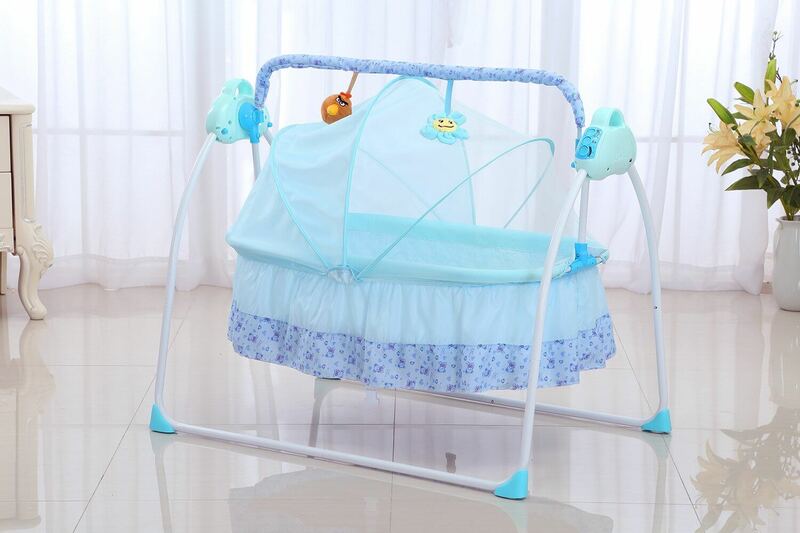 Cradle swings are designed with soft materials to make it more comfortable for the baby. There are also protective pads to keep the baby warm. Bouncer swings can keep the baby safe while parents play with them. Safety is one of the priorities of a bouncer swing but this should not be used for a long time. This can be used during playtime or nap time. This type is used mostly by babies that are one to three years old because of its capacity to carry more weight. This is also ideal when parents want to play with their babies while doing other chores. Regardless of the type of baby swing used, parents should not depend much on it in making their babies sleep or eat. Their children might get used to the swing so much that it would be hard for them to sleep or eat without using it. This type of swing is used for people with special needs. It’s not just for small kids, it’s also for physically heavier and older people with special safety mechanisms. It’s a circular type of swing which makes sitting in it more comfortable. It also opens up a lot of new types of swinging styles and positions. Are you looking for the best swing set for your little kid? Usually, this playground is bought during the spring – when the snow has started to melt and it is sunny enough to play outside. In the past, swings only came in one design, but as people become more skilled at constructing stuff, playground sets have become complex, yet super fun to play on. Make sure to buy a set, which is suitable for your kid’s age. To save money, most parents buy a swing that the kids can use until they grow up. However, not all playground equipment are built the same. The reason why infant swing sets are marked with the word “infant” on it is that they have special safety features to protect the babies. In addition, these swing sets have the right height for the little ones to enjoy. Most swing sets are made from cedar, redwood, or premium preserved pine. Cedar is known for its durability and versatility. Redwood, on the hand, has a naturally beautiful finish. However, it is slightly more expensive than cedar. The most durable all of the three is the preserved pine. Even with little maintenance, swing sets made from pine can last for a long time. This is the distance between the seat of the swing and the ground. Usually, swing sets have a deck height of around 4 to 6 feet. Larger playground equipment has a deck height of 7 feet and can even reach up to 8. Swings have two common base designs – square and angular. Square bases have little room below the deck, but you can install picnic tables and clubhouses on it. Angular bases, on the other hand, have bigger room below the main deck. It usually comes with a rock wall and tire swing. You can either select one base or combine both for improved functionality. These are just some of the things to consider when buying a swing set. Make sure to carefully select the playground set and establish rules so your little ones can have fun in a safe manner. Trusted manufacturers who sell outdoor swing sets are made of durable materials that are safe for babies and toddlers. However, parents still need to be vigilant when playing with their little ones to ensure their safety. Aside from choosing the right type of swing, parents should also consider the location of where they will install it and some tools that will further keep the kids safe. Check out this short article to learn more about important practices to follow when playing with your kid on an outdoor swing. Buying a giant swing for your child may be a good way to save money because you can ensure he will fit in the set once he grows up. However, this can be quite dangerous because larger sets do not have the correct safety gears fitted for your little one. 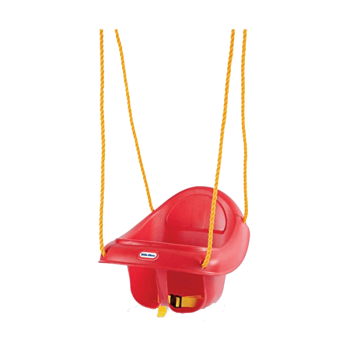 For babies and toddlers, buy a swing with infant seats to keep them safely in place as they rock back and forth. These sets are also not extremely high to avoid any mishaps. Most outdoor playground injuries happen because of accidental falls. It can be really difficult to restrain kids from climbing and jumping around when they are on the playground. The best thing you can do for them is to install the swing, slide or other playground equipment in a softer surface. That way, they won’t end up in tears while playing. Some of the kid-friendly surfaces where you can install playground sets are sand, pea gravel, shredded rubber, mulch, or pour-in-place rubber. Even though your kids are cute, lightweight balls of energy, you should still make sure that the playground equipment is secured firmly on the ground. Usually, you can seek assistance from the manufacturers when installing the playsets. However, if you want to do it yourself, take time to read the instructions carefully. To ensure stability, place the swing on even ground. In addition, make sure to remove any obstructions like rocks and roots. The last thing you want to happen is for your kid to accidentally face first on a tree root. This is one of the most important playground rules that should be drilled into your kids at a young age. By wearing properly fitted apparel, you can ensure that their shirt or pants will not be snagged to the swing set.